This is round three in D.C. for me so I’ll keep this guide current while including favorites from past visits. But first, cherry blossoms. 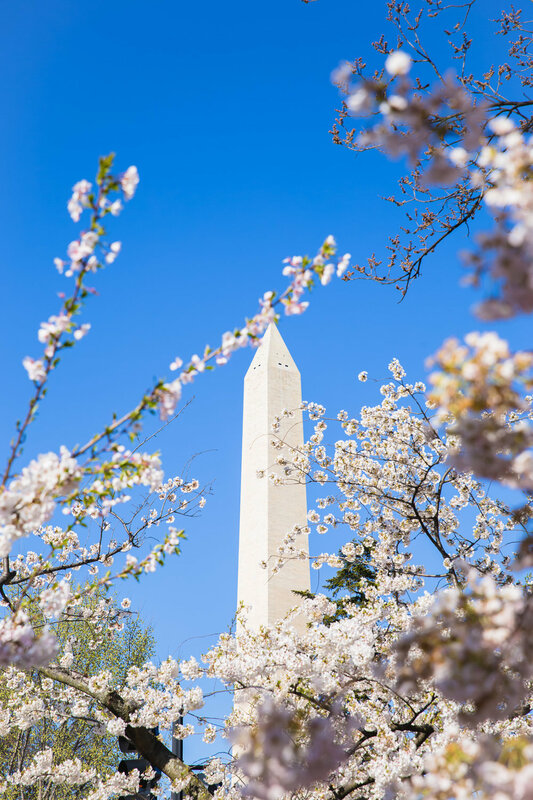 I know that chances are, you may not be visiting D.C. during the bloom of this truly stunning natural sight, but if you have plans for 2020 (good gravy, 2020?!) then I have a few tips. Follow @cherryblossomwatch on Instagram. The account is run by a local who give great insight and detail as the season approaches. 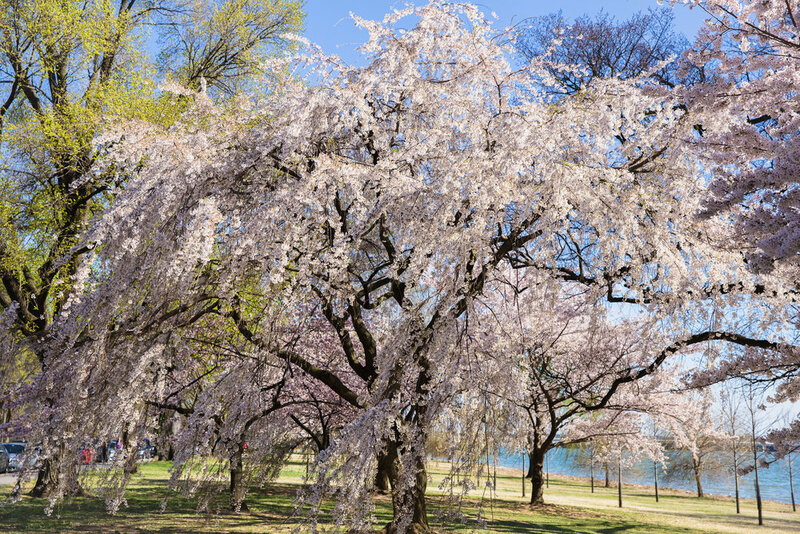 Cherry Blossoms are known to bloom in between March and April, but each year it all comes down to the weather. While forecast predictions are made, they are often changed and updated, so making concrete plans early on in the prediction is risky. 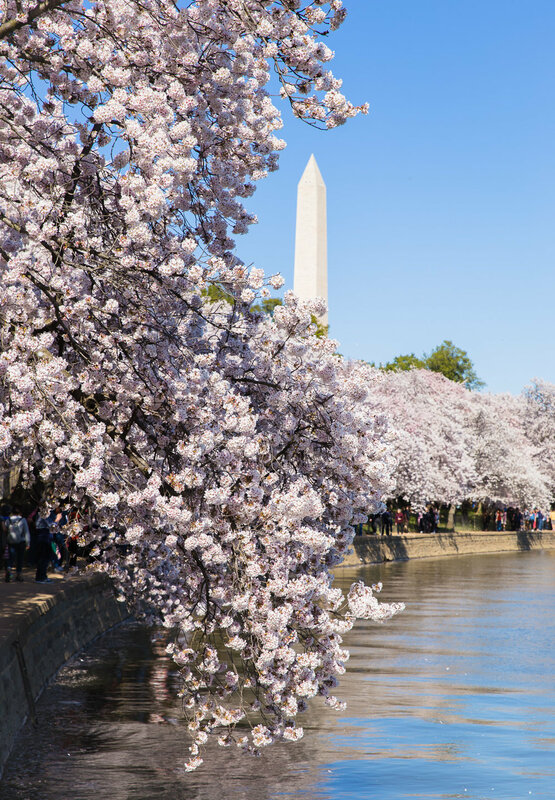 Hotels and Airbnb’s can get pricey during the Cherry Blossom Festival, so lock down your accommodations before prices inflate, but make sure they are refundable in case you need to alter your dates. Hold off on booking flights for as long as you can. This year, one warm weekend moved the peak bloom date up by five days. Once the peak bloom date has come, you still have about 10 days (weather permitting) to see full, lush trees. It’s better to get there “late” than too early. As you can imagine, the city is full of tourists, and it’s truly felt at the Tidal Basin and the monument areas. If you have a car I would not advise trying to drive nearby and park. It’s just madness. Walk from your hotel if you can, or take an Uber or taxi just close enough to not get stuck in the congestion. Walking is your friend. 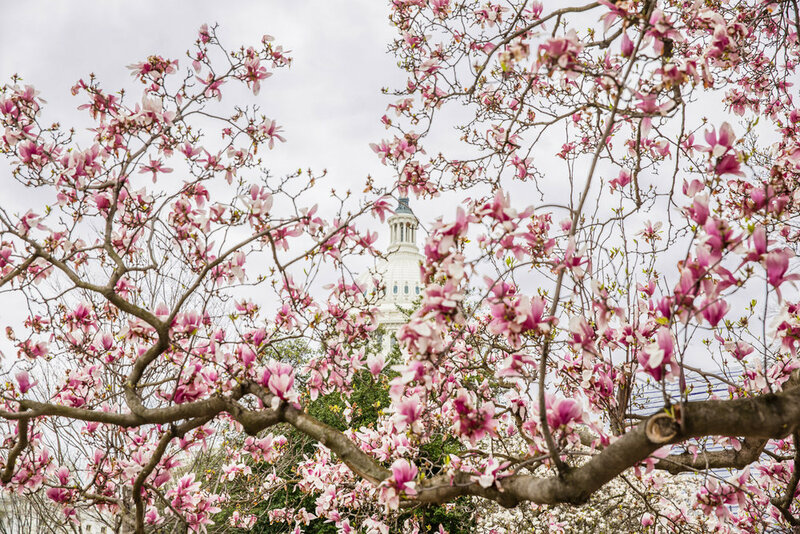 In addition to the cherry blossoms, the city is in full bloom of magnolias, tulips, and many other gorgeous flowers making this time of year a feast for the eyes and your camera. 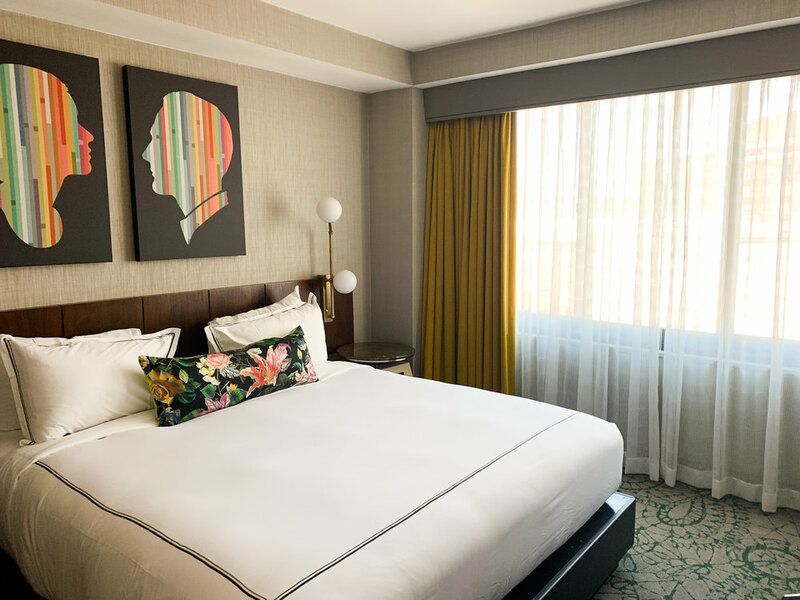 D.C. is a city that is meant to be walked, so I would strongly encourage you to make a list of areas you want to explore and find lodging somewhere in the middle. Each of my stays have been in-between Logan Circle and Dupont Circle. It’s away from the madness of downtown, but near neighborhoods with plenty of cafes, restaurants, and grocery stores should you need one. On this past trip I tried a new hotel, The Darcy. It’s a newer boutique hotel that I found to be very peaceful and comfortable. I know when it comes to lodging, it’s truly all about cost, but if this hotel is in your price range I wouldn’t hesitate to recommend it. 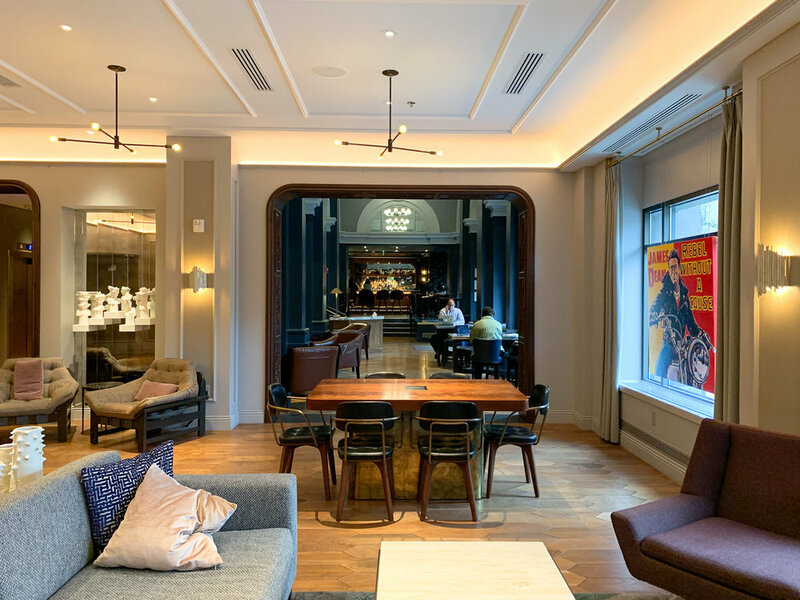 I’ve also had great stays at the Kimpton hotels in the city. While on most trips I stay in Airbnb’s, however in D.C. I do not because they are almost all apartments or condos. If I have a noisy neighbor in an Airbnb, I have no recourse to complain or be moved, so in the city I prefer hotels. It’s been said that the owners of this house found at 1112 Q Street painted their house fire-engine red, but the side of the house had a slightly different hue to it. They decided to paint a watermelon there and the rest is history as this adorable home is now a popular picture spot, even having its own hashtag #watermelon house. This flower shop is all over Instagram if you look up photos tagged in Georgetown. Lots of IG fashionistas take their outfit pics all over Georgetown neighborhoods, but this bright pink and green trimmed building seems to be the “it” spot. 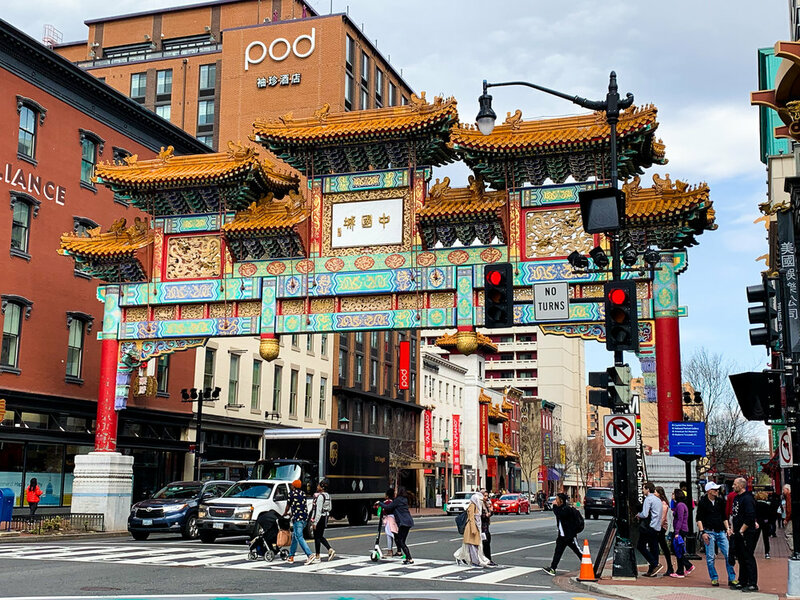 Sadly, D.C.’s Chinatown doesn’t feel quite as authentic as New York, Philly, or San Francisco’s, mainly due to the fact that its Chinese residents have been run out of the neighborhood. There are several articles about the struggle that has plagued this area, including how putting a huge corporate arena there further put them in jeopardy. While this beautiful archway exists and is picture worthy, much of what you see as you walk the streets of Chinatown has nothing to do with their culture. So, in my personal opinion, unless your objective in going is to find one of the few remaining mom and pop businesses to support them, I’d keep walking and remember what gentrification does to cultural neighborhoods. If you love La Colombe coffee like I do, then you get a twofer here. A latte stop and beautiful art found in this alley. City Center in D.C. actually has nothing to offer someone like me because I don’t shop at places like expensive designer shops, but as you walk through this outdoor space you’ll find what it’s actually known for on the gram: the different installations they have through the outdoor corridor. During the cherry blossom festival it was pink lanterns, but it’s also been known to have colorful hanging umbrellas, paper snowflakes, and other artistic elements throughout the year. There is also a huge digital installation you can walk under and enjoy. The artist Mr. Brainwash brought this mural to life on the backside of the Union Market. Fun fact, Michelle Obama left her mark on this wall. As you stroll down U Street you will find a lot of art in alleys on the side of buildings, so keep your eyes peeled. 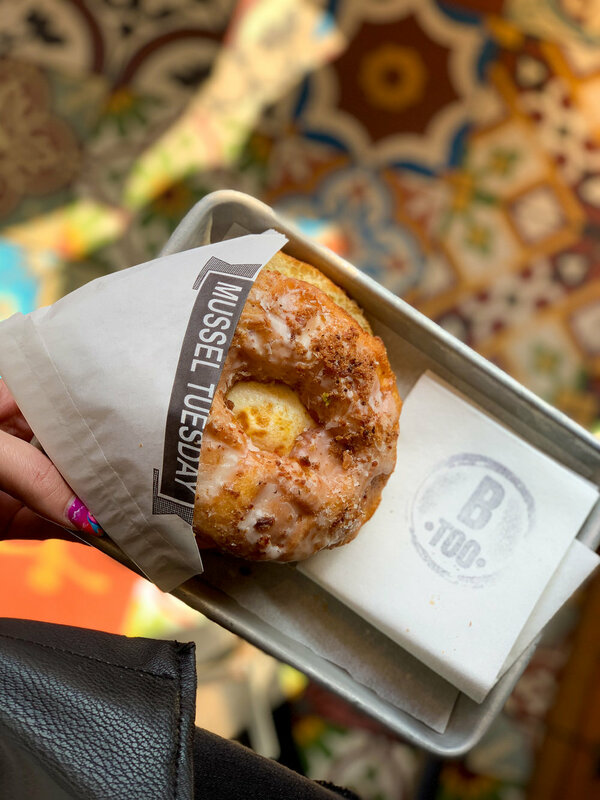 It’s a bit impossible to really explain what a foodie city D.C. is along with it’s heavy-hitting surrounding neighborhoods, but I will offer suggestions to the best of my knowledge. To think for a moment we almost didn’t go to Thip Kao. Wow, I’m so glad we didn’t let that happen. Truthfully it had been on my pre-researched list from the beginning, but it was out of the core of the city, and I kept pushing it back in our itinerary. We went hours before our plane took off and I’m glad I made the final push. The night before we had a very disappointing meal at Momofuku, (I guess just because you have your own Netflix show doesn’t mean your restaurant has it together) so I didn’t want to end our culinary journey in this city on a sad note. On a Saturday at 2 pm the restaurant was packed and I was glad I had made a reservation for what normally is the lull time in the industry. Well, not for Thip Khao. I guess in reality I’m actually not a very eloquent food blogger, because it’s hard for me to explain how good this meal was. From my limited experience with Lao food, I know it’s mean to be flavorful with several ingredients harmonizing together, but this was much more powerful than any place I’ve been able to visit this far. The Nem Khao Hu Muu was incredibly diverse in flavor. A little salty, a little (actually very) hot, a little sweet, a bit crunchy. It had everything in one bowl, and it has made “a last meal” dish in my opinion as long as Seng Luangrath, owner and chef, is in the kitchen. The wings and sesame jerky were simple and savory stunners as well. The story behind the mystery dish is that my husband was served something that didn’t resemble what he ordered. We tried to figure out what had come, and since the restaurant was slammed we decided just to eat it anyways. If you knew my husband, you’d know he is NOT an adventurous eater and often placates me by going to places that are truly foreign to his palette and comfort zone. Well, he loved literally everything we ordered including the mystery dish. Later the waiter came with the correct dish, but we were enjoying everything on our table, so it didn’t really matter. It was THE meal of our trip and I hope anyone who is near this restaurant goes. In 2018 Bresca received a Michelin star, and truthfully I only found out about that accolade after I dined there. It’s not surprising because it was an amazing meal. We ate there early in the evening on a Wednesday with no reservations with no issue, but if you are going to visit on a weekend or later in the evening I would suggest being safe and planning ahead. Each dish was top-notch, but the stand out was the shaved beef because I’ve never had anything quite like it. It was like a heavenly chicharrón wrapped in thinly sliced meat with some really beautiful flavors. 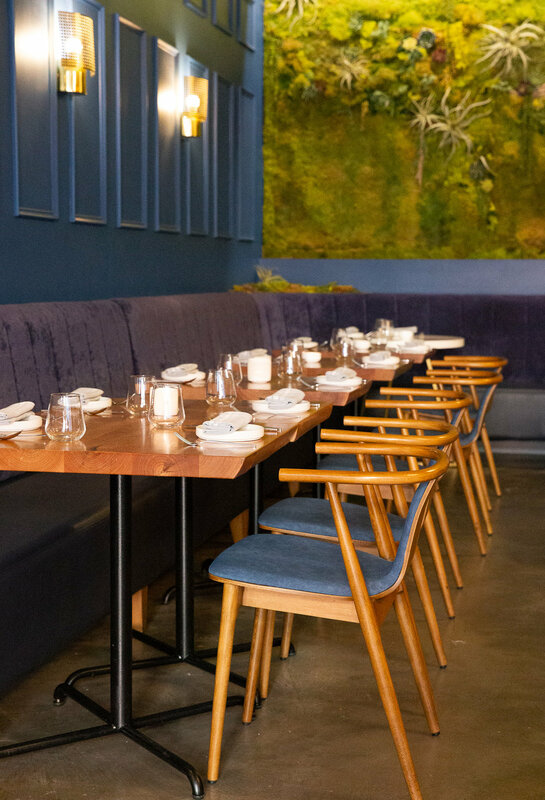 While Bresca’s menu and style give it the ability to be snooty, the service was very relaxed and personable, yet extremely attentive. No we’re better than you vibes felt at all. Itinerary worthiness: YES, but this meal is going to be a bit more of a splurge, but very much worth it if you want something elevated. 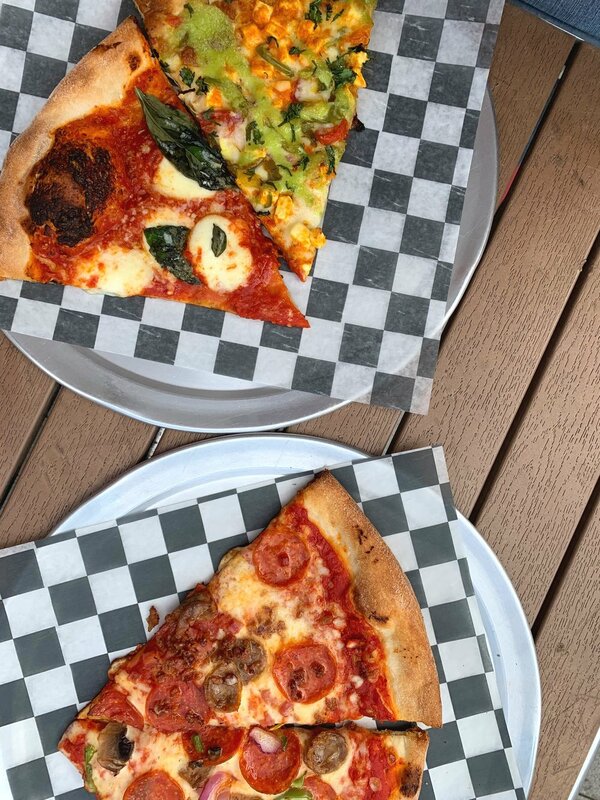 Typing “best pizza in insert your city here” is like asking twenty friends where they get their favorite slice and getting twenty different answers. You are left still not knowing where to go. 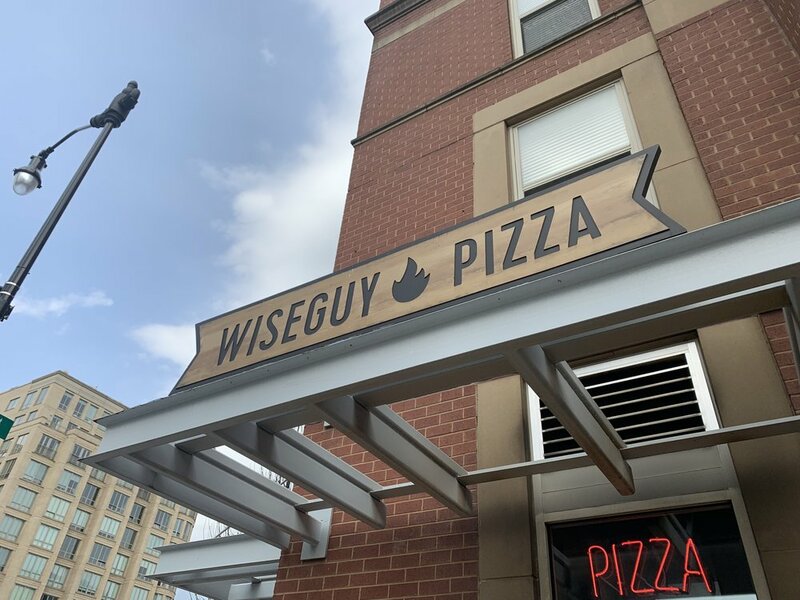 Wiseguy pizza was on most lists I looked at, but also appeared to be a cheaper and quicker alternative while we were exploring. Located in near Chinatown, we stopped in for a few slices and I was happy with the outcome. What I appreciated was the variety of options which included Paneer Tikka, an Indian dish on a pizza. Genius. Itinerary worthiness: Go if you are nearby, but don’t make a special trip. I love matcha everything, so if you are like me than there is no harm stopping at Bôn Matcha. It’s a small window on I street in the Foggy Bottom area of town. Offerings are limited, but this did happen to have the seasonal cherry blossom flavor (extremely mild flavor) that I got swirled with matcha. While I enjoyed my soft serve, it had a pretty quick effect on my stomach, if ya catch my drift. Maybe make sure you are near a bathroom after you eat it, just in case! Itinerary worthiness: Don’t make a special trip, but if you are nearby go, but don’t wait in a crazy line. Union Market is definitely out of the core of D.C. so you need to Uber there if you don’t have a car. Whether it’s worth it truly depends on what you order. Firstly, this is a decent sized market with several options, but due to the rainy overcast day there was absolutely no where to sit inside. We ate everything standing up, so just be aware, that can happen. The tacos we got were a bust, as were the doughnuts (so disappointing), but the saving grace were the bao buns from Bun’d Up. My recommendation if you go, is to do your best to find the food vendor that is going to leave you the most satisfied, but that’s so hard to know in advance. The market itself is beautiful and has a good flow. Itinerary worthiness: I wouldn’t make a special trip unless you are really into visiting markets in the cities you visit. There are so many great food options in D.C. that don’t require a special trip out. 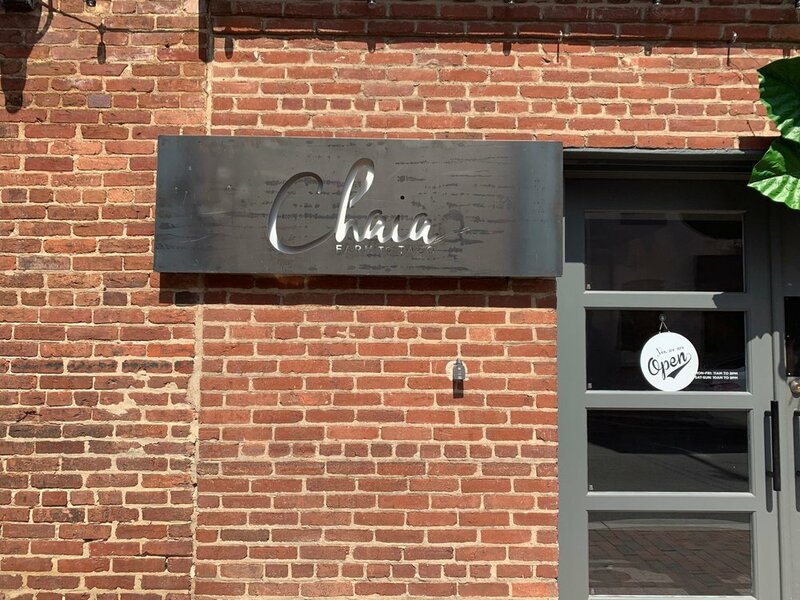 Hungry in Georgetown, I found myself looking at the list of restaurants I had bookmarked, but I was drawn to Chaia tacos. The tacos are farm to table with one caveat; they are vegan. I was skeptical, but had seen the rave reviews, so we said goodbye to a greasy burger lunch and found ourselves in an extremely packed and small shop. My quickly taken, lackluster photo doesn’t do these tacos justice. They were incredible and that is no exaggeration. The flavor packed in these veggies and sauces was what made them a hit and left you not missing meat in any way. I wanted to order more, but the lunch line had grown very long, and with good reason. Not waiting in line for another round is a true regret. In addition to stellar food, this is a female owned business that got their start at the local farmer’s market. 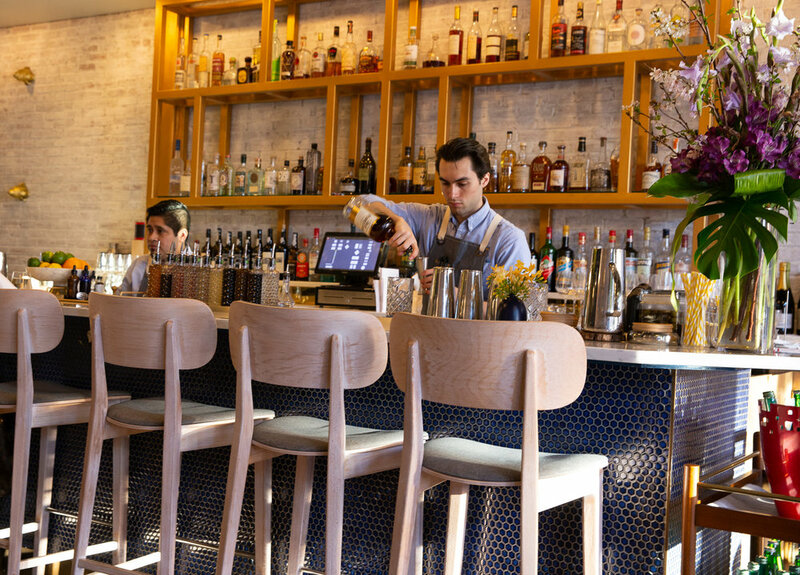 This spot is off the main drag, so put it on the list and don’t miss it. Breakfast on fast-paced trips like these usually is a coffee shop + pastry run so we can keep it moving. On the one rainy day of our trip we visited Unconventional Diner. After researching online I thought this was going to be a full-service situation, but half the restaurant was closed, and a small cafe section was open for counter service. No problem, we could deal. 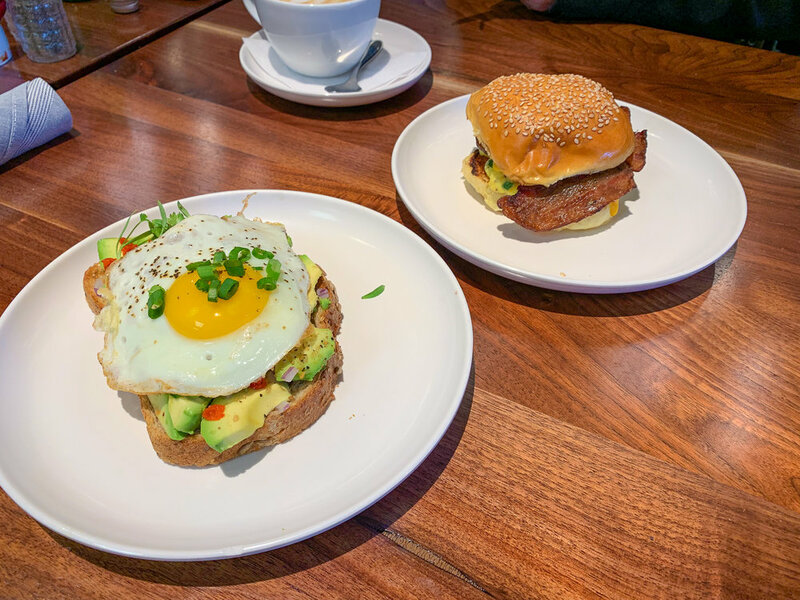 Our breakfast was your standard avocado toast and a breakfast sandwich. Not bad at all, but not a must visit. 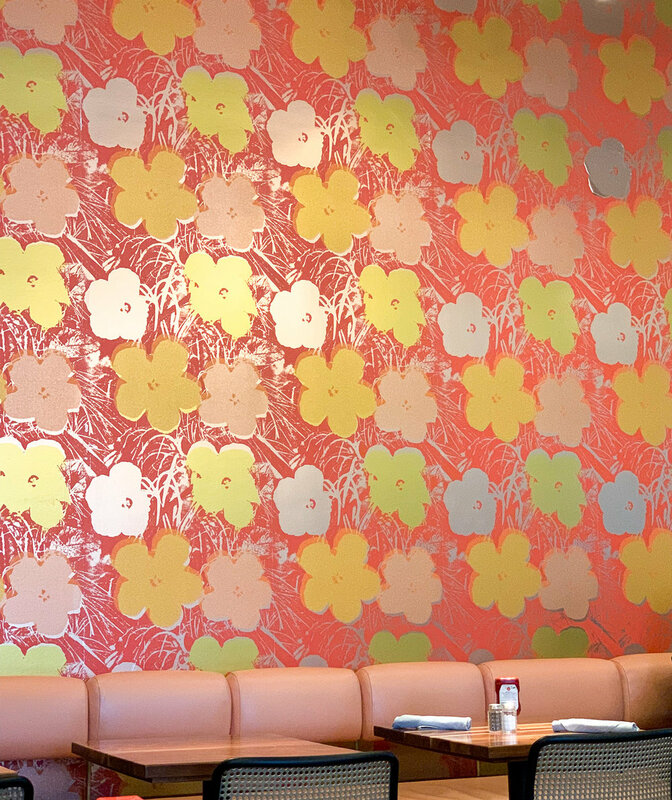 However, the restaurant is very cute, so perhaps it’s better suited for a lunch or dinner? It’s also a block away from a La Colombe where the LOVE garage is located. Itinerary worthiness: Worth a grab ‘n go if you are in the area, but no big deal if you skip it. Somehow I didn’t go dessert crazy on this trip. The city doesn’t have amazing doughnuts, and I didn’t hit the bakeries I wanted to, but I did manage to hit up a Milk Bar twice. We were staying two blocks from the flagship shop at Logan Circle and I took advantage of that because I’m a glutton for soft serve. 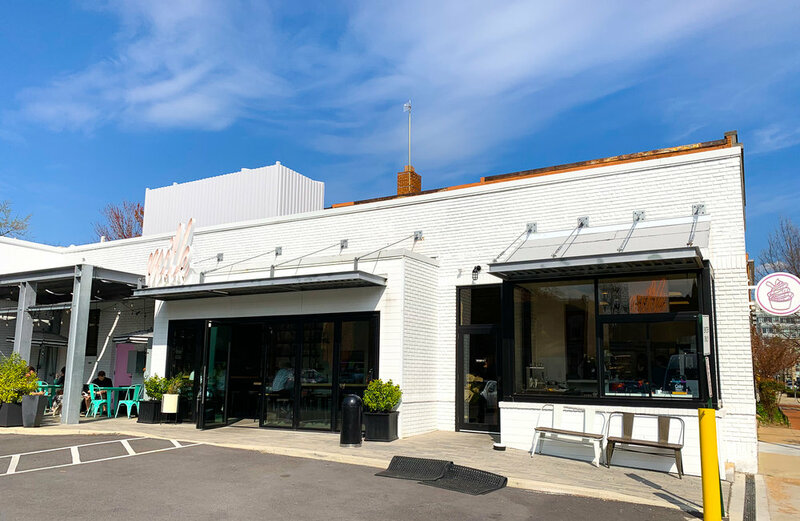 This is a much larger space than her other locations, and you are able to take full slices of cake to-go along with other baked items as well as Milk Bar merchandise. Itinerary worthiness: Even if you aren’t a fan of Christina Tosi I would stop here for a quick treat. It’s hard to beat the sweet and salty of the cornflake crunch topping. B Too is a Belgian restaurant that we stopped at for a quick breakfast on a Saturday morning. It had a very weird vibe, like all the employees had closed the night before and were miserable; but we sat in their bar area and I focused on the waffle maker pouring loads of batter, one after another to pass the time as I waited for my breakfast. DOFFLE® SANDBICH original Doffle® (a doughnut waffle) bacon sprinkles, pork sausage, american cheese, special sauce, egg sunny side up. My breakfast sandwich was actually really good which was a shame because we honestly couldn’t wait to get out of here. Itinerary worthiness: Hard to say, you can probably find a better atmosphere for breakfast, but my meal was tasty. Also, it’s important to note that the sandwich I got has an almost identical cousin you can order during the week for half the price. Founding Farmers - we didn’t go this trip because we’ve been twice and wanted something new, but we loved it each time. The Pig - We actually did visit this spot for our third time and still enjoyed it. Great burgers, great sides, and everything on the menu comes from the animal bearing it’s name. Sorry vegans, this one is not for you. Truth be told, when I searched for coffee shops in D.C. I found a lot of places I was already familiar with, so this will be short and sweet. We skipped breakfast in Georgetown and just stopped at a sweet little cafe off the main drag. It was very small, and is a laptop free zone. They have very instagrammable drinks online, but once inside there is no mention of any of them on their short menu, so you need to go in knowing what you want to order, or just be prepared to show it to them. I got the Day Dream latte, which is actually just a regular iced latte made to look more appealing. Itinerary worthiness: There aren’t a ton of coffee shop options in Georgetown that are locally owned so it’s worth a stop. Baked & Wired is another place you can stop if you miss this one. D.C. is definitely the city of museums, so for whatever floats your fancy, there is mostly likely a (free) museum to wander. Other than the Newseum, the Hirshhorn is my favorite museum in the city. The rotating exhibits are always interesting and even interactive at times. The current Pulse installations by Rafael Lonzo-Hummer allows museum goers to put their hands or finger on pads that turn their pulse into art in pools of water and lights on the walls. There was also a huge room of eerie lighting that was mimicking pulse activity. We walked through it more than once, it was very cool. 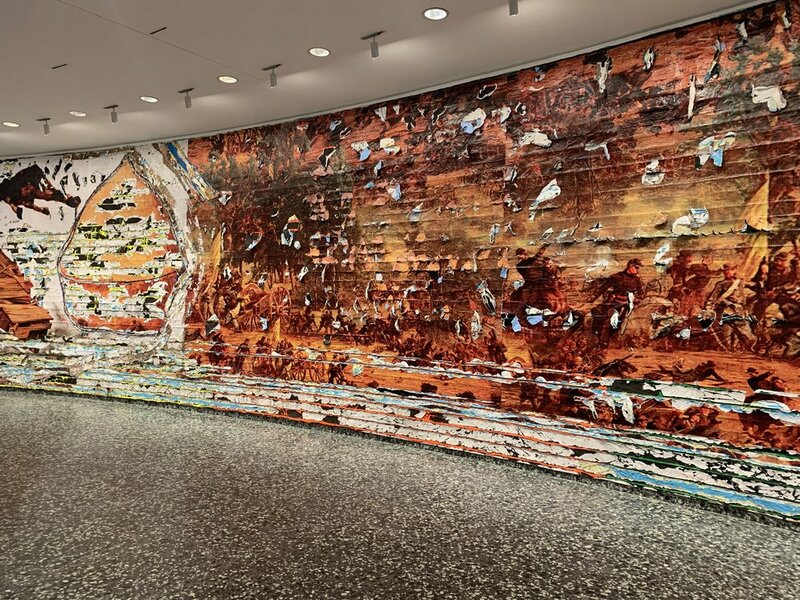 It’s rumored the Hirshhorn acquired Yayoi Kusama's first Infinity Mirror Room for their collection to go on display in 2020, so keep your eyes peeled for that if you are planning a trip next year! Itinerary worthiness: Absolutely go, no question! 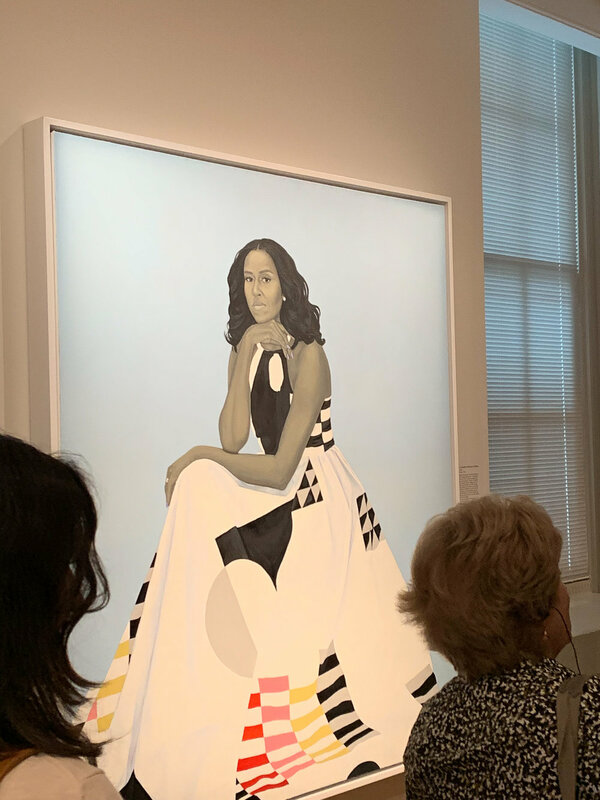 The portrait gallery houses the very popular portraits of President and First Lady Barack and Michelle Obama, but the entire Presidential gallery is interesting to explore. John F. Kennedy has a very unique portrait as well! Also a favorite in this museum is the contemporary art wing that houses the Electronic Superhighway and the Art by African Americans exhibit. Pieces of those are seen below. 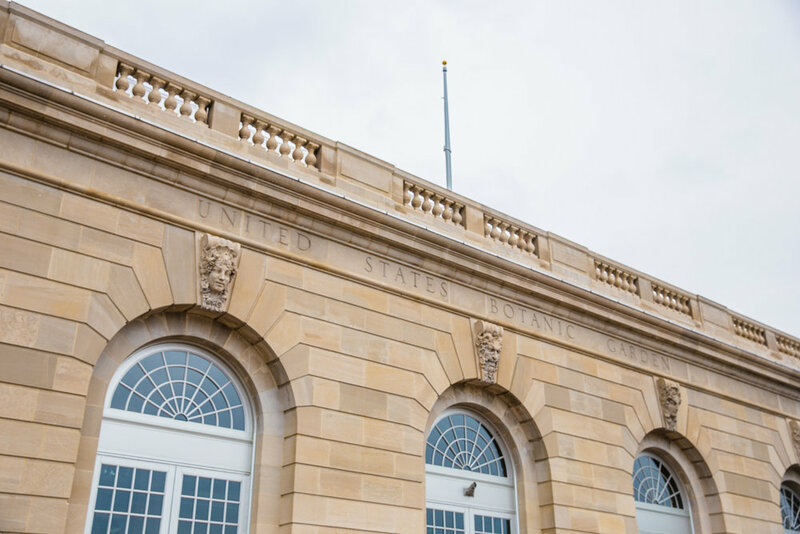 This building is beautiful on the inside, so even if you aren’t extremely interested in every exhibit, it’s worth walking through. Itinerary worthiness: Personally, I went for the contemporary art wing, but you can walk the entire museum in under an hour if you are looking at select pieces. I’d squeeze it in! If you are truly a plant lover this free garden needs to be on your list. The large indoor conservatory is lush and beautiful, and you get to view it from different angles thanks to the overhead canopy walk. My recommendation to you, for this botanic garden and any museum for that matter, is to call ahead and ask if field trips are scheduled the day you plan to visit. We did a lot of museum hopping on Friday and the amount of elementary field trips that were happening was insane. Try to avoid if at all possible. 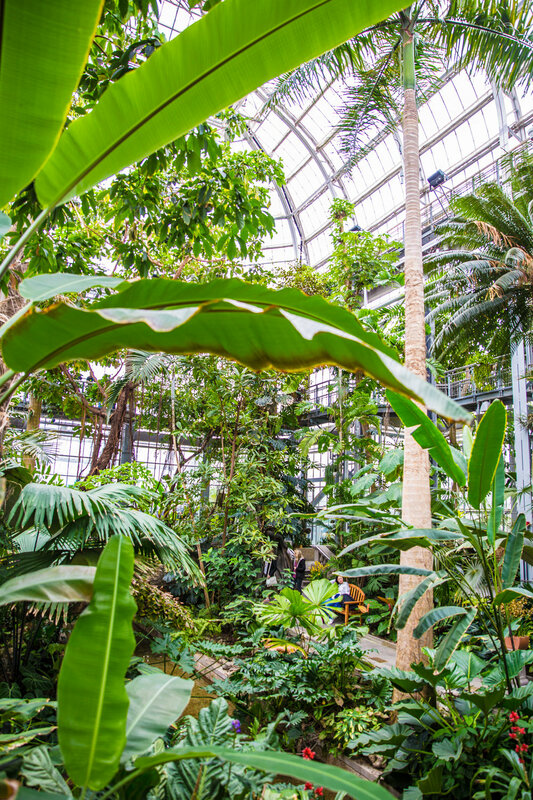 Itinerary worthiness: Unless you are carefully inspecting every single plant, or holding an intense botanical photo shoot, you can thoroughly walk this space in under 45 minutes, so it’s worth a mini slice of paradise in the city. The Newseum - It’s honestly my favorite museum in the city, but it is not free. If you are a news/journalism junkie I would absolutely go. They have a piece of the Berlin Wall and a very moving 911 exhibit. You also cannot beat the view of the Capitol building from the rooftop. This is HIGHLY recommended. National Air + Space Museum - Definitely not my jam, but I’ve been dragged in here several times. There are some interesting items to check out and also see what’s playing in the planetarium. National Museum of African American History and Culture - This may be the most stunning building in all of D.C.
Capitol Tours - We did this on a previous trip and honestly if you love history it’s a great tour. Took me back to my field trips days. Laugh all you want, but 45 minutes inside this Georgetown cat cafe was extremely relaxing. I’ve been to a cat cafe outside of Orlando, and it wasn’t quite like this experience. They book you by reservation and take orders of any drink (closed top) that you may want to enjoy while you play with the rescued cats. The decor is clean and bright, all white with pops of pink and green, and your senses are hit with a strong scent of lavender with zero traces of cat smells. There is plenty of plush seating areas for you to snuggle with the cats. You are paying a fee to spend time with the cats, but the great news is that not only are you helping keep these cats alive while homes are found (almost all the cats we played with were already adopted), but the girls that work there do a really outstanding job in their service. They make sure everyone is moving around and not hogging spots for too long, they are bringing you cats and they know each cat’s personality, and they come around taking Polaroids of you to keep as a memento. This is how you run a cat cafe. 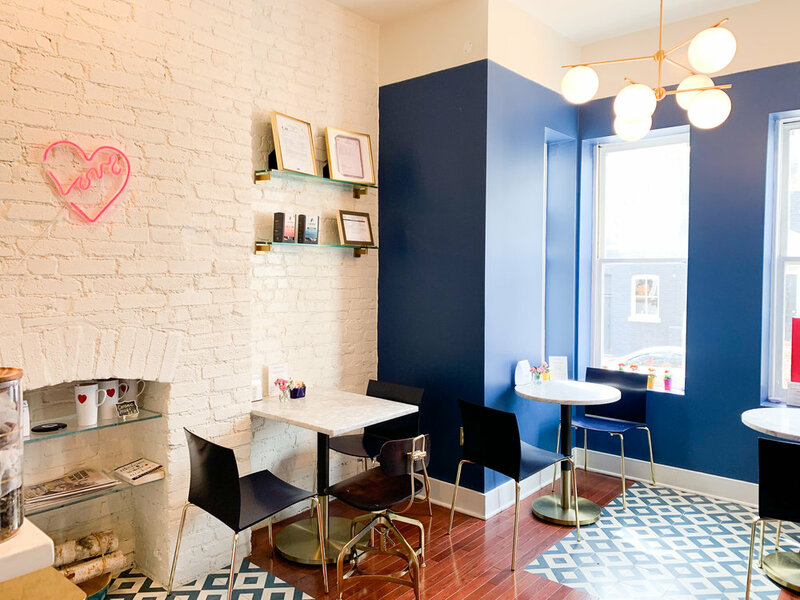 Itinerary worthiness: Cat lovers should go, but make a reservation ahead of time. If you don’t want to pay, you can look inside and get a quick dose of cuteness as you explore Georgetown. 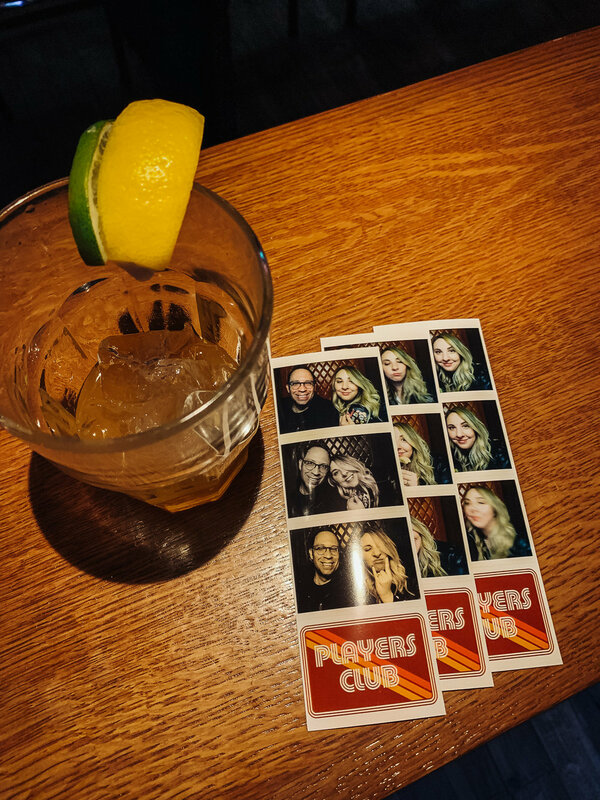 There are a few barcades around D.C. but the Players Club was the only one we were able to squeeze in. In all honestly it definitely leans more heavily to a bar where locals were hanging out, with a few casually playing pool. Almost no one was playing the arcade games. A true travesty. We took full advantage of the pinball games and other arcade games and a photo booth in the back. Everything is pay to play. If you feel like enjoying the 70’s basement vibe just to hang there are board games to grab as well. 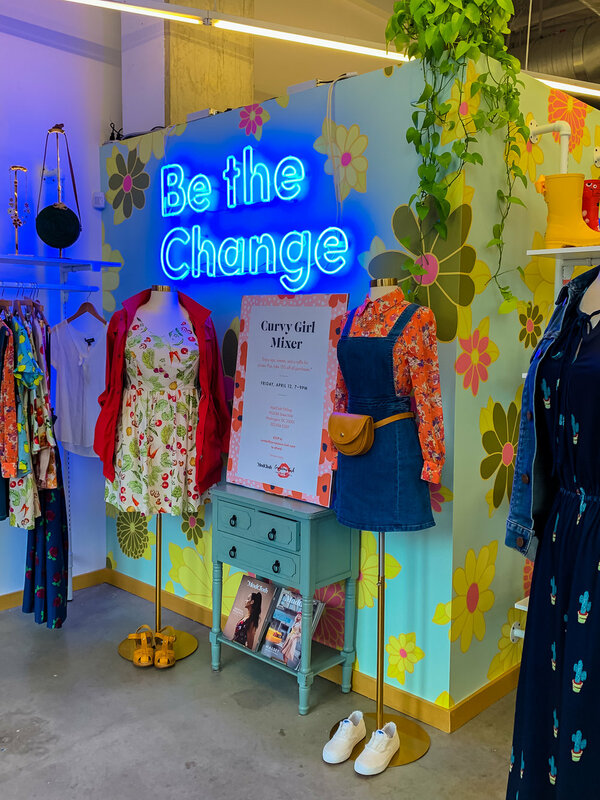 If you have been an avid ModCloth shopper and fan for awhile (even after their controversial sale to Jet, a subsidiary of Wal-Mart), then you will be happy to know D.C. has a Modcloth to shop IRL! It’s not a huge space, but there are plenty of vintage inspired pieces to drool over. Only one size for each item is on the floor, but the back stock room holds all sizes going up to 4X. The kicker is, if it fits, you don’t walk out with it, but they do send it expedited shipping to you for free. However, I did leave with a pair of sunglasses, so accessories might work a bit differently. With the exception of New York, D.C. is the city I’ve visited the most times and it’s because I’ve never found myself bored there. There has always been something to explore, especially with the neighborhoods that surround the city. I hope you find my tips helpful, and build a fun itinerary of your own. All photos are property of LemonHearted Creative. This was a personal trip, no accommodations or meals were provided or discounted and no businesses were made aware they were being featured.